I’ve been playing Holy as my primary spec since Vanilla. 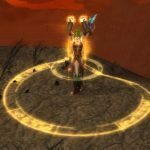 Holy has had a number of changes through the years going from general healers, to tank healers, to raid healers, to nearly exclusively raid healers. A lot of these roles have bene defined by the way our Tree is structured. What talents and throughput abilities you have available to you really can define what roles you can fill best. I use the term “best” because, of course, you can fill a tank healing, tank support, or raid healing role as any healer— but in my opinion “best” also weighs in what your talent’s benefit most. With Cataclysm, we’ll see a good deal of improvement to our healing flexibility via these talents. Lets take a look at some of the current talents on Live to better appreciate what has been going on with the Cataclysm Trees. Holy, right now, is best suited for raid healing. This is primarily due to the number of spells and talents we have that ramp up our AOE healing, and the ZOMG Scaling that renew has in ICC level gear. (Putting Renew superior to Flash Heal) However, if we want to tank heal as a Holy Priest there are a good deal of points and talents we would need to take. No other healing class has to respec to be a tank healer. (Yes, there are some talents that some of the other classes could possibly want to take but they don’t have to, to be an effective tank healer). However, as a priest you would need to spend 13 talent points to be a tank healer and not a raid healer. Yes, you heard me correctly: 13 points. You would need to take 5/5 Divine Fury, this will allow for our Greater Heal to not be cast at a glacial pace. You will also need to pick up 5/5 Improved Healing for mana efficiency, and 5/5 Empowered Healing for spellpower throughput. That is a good deal of talent points that need to be moved around. Some priests have these talents already, however they usually are raid healing– to you I as: When was the last time you cast a Greater Heal? Is it really worth all those points? Holy is an exceptionally versatile tree now, and our talents really are streamlined down. At the end of the day I am very pleased with how the Holy Tree is currently looking. Chakra has become the cornerstone of the Tree. Couple Chakra with Revelations and State of Mind and we have some great versatility. Tank healing is well within our reach again! We have improved throughput with Flash Heal, Heal, and Greater Heal at our disposal. Chakra: Heal making it pretty easy to keep up our Renew on our tank with heals, and the 10% crit chance bonus makes us very paladin-esque. Speccing into Revelations, we have Holy Word: Serenity to provide a hefty instant heal on our target (with a fair cooldown), and an immediate throughput bonus by providing a higher crit chance. (Personally, I feel the Crit bonus needs to last a few seconds more… 10 seconds seems fair. 6 seconds with GCDs and cast times means you are getting maybe 2 Heal casts in there– however, with Chakra: Heal already up… how much more crit do we really need?) With our Mastery providing a rollling hot (the latest beta patch fixed the overwriting issue) in dungeons I’ve been able to keep a 800-2000/sec hot just from tank healing– in heavy Mastery gear). Tanks will be kept safe in our hands! Holy Word: Serenity will help us out when covering multiple raid members with renew, and will come in handy when doing tank support– by being able to provide a 2nd hot on the Main Tank. If we need to raid heal, we can switch to our Chakra: Prayer of Healing and get our 10% AOE bonus and use COH, POH, Holy Nova (remember it is raidwide now) and Sanctuary. With Chakra becoming the cornerstone of the Holy Tree, I’ve found a good deal of renewed hope with Holy. It is really enjoyable in the dungeons I’ve run. Blizzard hit it out of the park on this one—”Chakra is why you want to be holy”. Discipline does need some work, as it just seems a little lackluster… Blue has clearly been focusing on Holy much more. My Disco brethren need there tree reworked too! I think my biggest issue with Disc is Archangel and Evangelism… it just doesn’t seem to feel like it fits. I keep on feeling like I am forcing myself to smite; but then I have to scramble to heal the tank. (Perhaps it is a gear issue). I am sure we’ll see some revamping in the Discipline Tree soon. This video will explain the Throughput improvements and Revelations, as well as show you the animations that each of the Revelations provides. This next video is completely gratuitous, and is me just playing with Leap of Faith! I do see the application of how this spell could be handy, but the mana cost and cooldown is quite prohibitive. 6.6k mana for LoF? Wow. Don’t forget! If you are going to Blizzcon or live in the Anaheim, CA area to enter our The Raid Pre-Screening Contest! All of the information in this post is based off of Beta Build 12857 and, of course, is subject to change.